Do not use comfrey on dirty wounds as rapid healing can trap the dirt or pus. 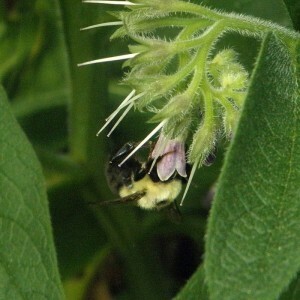 The use of comfrey root is not suggested as it contains toxic alkaloids, mainly pyrrolizidine. It is unclear as to whether the alkaloids are toxic in the context of the whole plant, since they are only present in minute amounts and are often completely absent from samples of dried aerial parts. The highest concentration is in the root, having almost twice as much as in the aerial parts. Until such time as it is proven one way or the other, use of the root internally is not advised. It should be noted that Swedish researchers have determined that these alkaloids are destroyed when making a decoction of the aerial parts. Internal use of comfrey is not recommended. Indigenous to Europe, comfrey now grows in all temperate regions of the world, including western Asia, North America, and Australia. 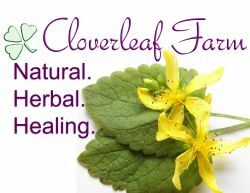 The herb is a perennial that grows up to three feet, producing thick leaves and bell-like white to pink or mauve flowers. It thrives in moist, marshy places; but it can send down a ten-foot, or longer, taproot to raise moisture and valuable minerals. The leaves and flowering tops are harvested during the summer. The root is harvested in the spring or fall when the allantoin levels are the highest. Long used to heal wounds, the comfrey leaves and roots have been used to cure ailments ranging from stubborn leg ulcers to broken bones, and hence its common name of “boneset” or “knitbone”. During ancient times, comfrey baths were popular before marriage to repair the hymen and thus restoring virginity. Since 400 BCE, early Greek physicians have used comfrey to stop bleeding, treat bronchial problems, heal wounds, and mend broken bones. During the Irish potato famine of the 1840s, an Englishman named Henry Doubleday became convinced that the world could be saved from hunger and suffering by using comfrey. He established a charitable organization to research the cultivation and use of the plant that exists to this day and continues to publish pamphlets and books on its usage. The active ingredients in comfrey herb are allantoin (a substance that fosters the growth of new cells), rosemarinic acid (an anti-inflammatory), and mucilage (a gummy substance that soothes inflammed tissues). Allantoin is credited with encouraging bone, cartilage, and muscle cells to grow. However, a soothing solution can be made from the leaves steeped in hot water; but its effectiveness is lessened by heat. The roots contain about twice as much allantoin as the leaves. Pharmacists may add allantoin to ointments and creams to enhance skin-healing properties. Poultices made from the fresh leaves are applied to rough skin, aching joints, sores, burns, cuts, sprains, and to reduce the swelling around fractures. They can also applied to minor fractures that would not normally be set in plaster, for example, broken toes, ribs, or hairline cracks in larger bones. Poultices from the root are ground into a powder; a little water is added to make a paste that can be used on stubborn wounds and bleeding hemorrhoids. Creams are used for bone and muscle damage, including osteoarthritis. Infused oil (hot method) is used on arthritic joints, bruises, sprains, other traumatic injuries, and for inflamed bunions. Tinctures of the comfrey root are applied undiluted to acne. Ointments made from the leaves are used on bruises and scrapes. Comfrey leaves are dried, ground up, and mixed with water, a moisturizing oil, or aloe vera to form salves or pastes that can be used externally to promote the healing of skin ailments, while reducing inflammations and infection. When the crushed herb is applied to an injured limb, the allantoin is absorbed through the skin to speed healing. When a compress is applied immediately to a sprained ankle, it can significantly reduce the severity of the injury. A lotion or solution of comfrey leaves made by soaking them in hot, but not boiling, water andcan be applied to abrasions to soothe the irritation. Dried roots may be ground up and dissolved in hot water to form a mucilage that can bind together such open skin ulcers as bedsores, that have resisted other forms of healing. Although the root has similar properties as the leaves, it tends to be colder in nature and more nourishing in action, therefore, better suited in treating varicose ulcers. The combination of tannins and mucilage helps soothe bruises and scrapes. 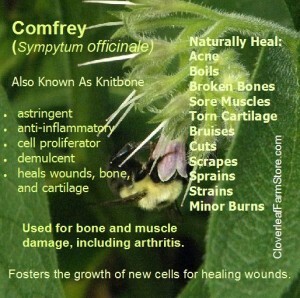 Externally, comfrey leaves are useful in healing stubborn skin ulcers, bedsores, and other lesions. They can also promote the healing of minor burns, eczema, and psoriasis, soothe bee stings and spider bites (including those of the brown recluse), and treat skin staph infections and athlete’s foot. A poultice can be made from freshly chopped leaves and applied directly to the wound and covered lightly with a bandage. This should be changed every day, and the wound cleansed with water (not tap) and a mild soap. The area can first be cleansed with hydrogen peroxide if there is infection present. View: Comfrey Products from Cloverleaf Farm.